Teeth whitening is a safe and non-invasive treatment which can provide a cost effective means of improving the appearance of your teeth. The treatment involves the application of a special gel to your teeth and this acts on the enamel to whiten your teeth. If you feel that discolouration of your teeth is spoiling your appearance, then tooth whitening may be the answer. A safe and non-invasive treatment, tooth whitening involves the application of a special gel to your teeth and this acts on the enamel to whiten your teeth. To request an appointment, please call in, phone or select "appointments" from the menu above. Before undertaking whitening, you will be asked to attend a short consultation during which your teeth will be checked for suitability for whitening and the process & risks will be explained to you. Following this, you will be asked to sign a consent form and impressions of your teeth will be taken to enable preparation of your whitening trays. A week or so after the initial consultation you will return to the practice for a short appointment during which you will be issued with your whitening kit, instructed on its use and have the first application of gel. The remainder of the whitening process is undertaken at home. Each day over a two week period, a small amount of whitening gel is placed in each tray and the trays worn for 30-60 minutes. Following removal, your trays should be rinsed and your teeth brushed to remove any gel residue. 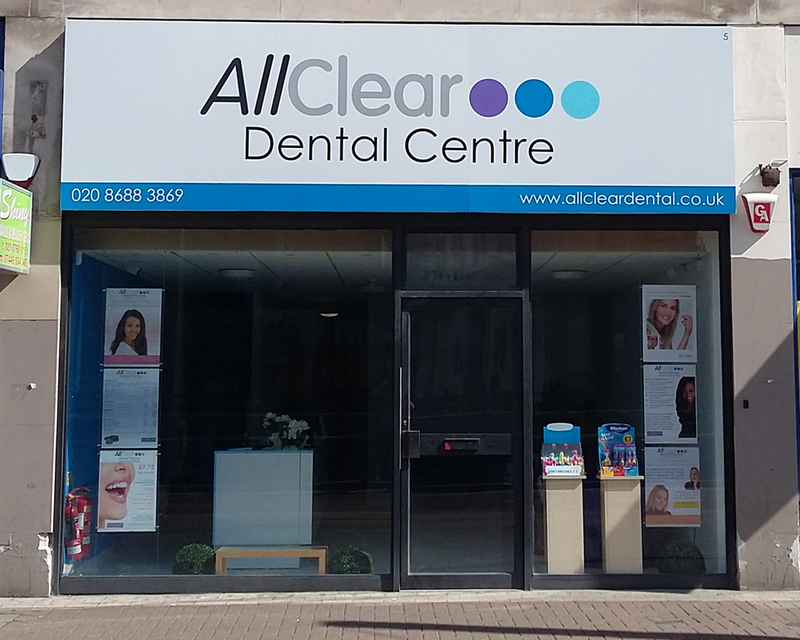 At AllClear, teeth whitening is overseen by fully qualified & registered dentists. The materials we use are supplied by recognised suppliers of dental goods and fully comply with UK law (specifically The Cosmetics Products (Safety) (Amendment) Regulations 2012). This means that you can undergo your treatment in the knowledge that you will be treated by dentists with the necessary knowledge and training to undertake the procedure safely using materials specifically developed to whiten teeth. We will be happy to explain all aspects of the treatment to you if you have any concerns or questions. Over time, you may find that your teeth lose some of their whiteness. The speed that this happens will depend on your diet, your lifestyle and whether you smoke. In such cases, you may wish to top up your whitening by repeating the process. Providing that you had your initial whitening done at AllClear and still have your whitening trays, we will be happy to sell you a new whitening kit at a reduced cost. However, to comply with the law, we must re-examine you, check that your trays are still in good condition and fit properly and undertake the first gel application in the surgery. Therefore, if you wish to purchase additional gels, you will need to make an appointment and bring your whitening trays with you when you attend - unfortunately, the law no longer permits us to sell syringes of whitening gel over the counter. Q. Is tooth whitening safe? A. It is a non-invasive treatment; in other words it requires no preparation or drilling of your teeth and does not affect the structure of your teeth in any way. You may feel some sensitivity on your teeth after the treatment but this should subside within 24 hours. Q. How long does the whiteness last? A. Normally at least 18 months although smoking and regular consumption of strongly coloured food & drink will shorten this. Q. How do I know if I am suitable for teeth whitening? Q. Why don't you do in-surgery whitening? In November 2012, UK law governing teeth whitening was changed. 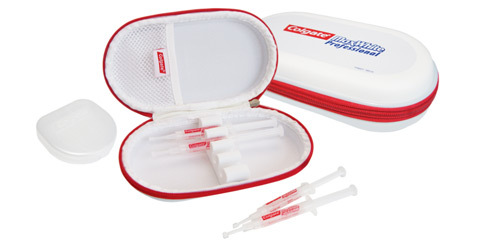 The maximum permitted hydrogen peroxide concentration is now 6% (which is equivalent to approximately 18% carbamide peroxide which some gels contain) which is sufficient to give excellent results over a period of 1-2 weeks in home kits but is not strong enough to whiten teeth in the 1 hour or so which in-surgery whitening requires. Gels exceeding 6% hydrogen peroxide or equivalent are now illegal and are no longer supplied in the UK. Q. Won’t whitening toothpaste or over the counter whitening kits give the same results at a fraction of the cost? The majority of over the counter products are ineffective, at best removing surface staining. This is because the maximum hydrogen peroxide concentration permitted in over the counter products is 0.1% which is insufficient to have a discernible whitening effect. Q. How white will my teeth become? We cannot give any guarantees as to how white your teeth will become as a result of this treatment. As the gel acts on the enamel of your teeth, the degree of whitening achieved will depend on a number of factors including the structure of your tooth enamel, the existing shade of your teeth and your lifestyle. Please bear in mind that many celebrities with white teeth have often had veneers placed on their teeth and that photographs in magazines etc. are usually digitally enhanced or ‘airbrushed’. If, during your initial examination, we feel that the process is unlikely to give you the outcome you are seeking, we will advise you accordingly. Q. Can my child's teeth be whitened? No. The Cosmetics Products (Safety) (Amendment) Regulations 2012 stipulate that teeth whitening products may not be used on anyone under 18. Q. I've seen 18% peroxide gels - aren't these illegal? Not necessarily. Providing these are supplied and administered by a dentist, the gel was probably carbamide peroxide. This breaks down to 6% hydrogen peroxide which is within the legal limit and therefore permissible. However, if the gel is not supplied by a dentist (e.g. advertised on line) it may be illegally imported 18% hydrogen peroxide gel which can cause injury to your gums and should not be used. Q. Do I have to buy my tooth whitening kit from a dentist? In short, yes. The Cosmetics Products (Safety) (Amendment) Regulations 2012 states that peroxide based teeth whitening products of over 0.1% concentration may only be supplied to dental practitioners so any manufacturer or distributor supplying to other bodies would be in contravention of these regulations. Also, do not be tempted to buy whitening products over the internet; these can be damaging to your teeth and gums and whitening should always be done under the supervision of a dentist in case of complications.